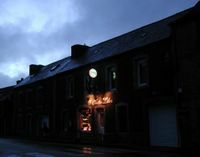 I thought of this picture as I passed a local bar in the rain on the way home tonight. Two years ago at this time of year I was the crazy American woman (who allowed everyone to believe she was English, since she's a coward) staying in a farmhouse apartment in Brittany for a week. I'd just finished a European tour getting feedback on my product of the time, which hadn't gone so well. I was a bit depressed; and at night I thought someone or something was moving boxes around in the room overhead -- which was locked and seemed to be just a crowded storeroom when I finally peeked through the keyhole during the day. Muscular squirrels? Ah, Muscular Squirrel. He was in the same house at me at Eton, along with Suburban Stoat. Well, sheesh -- were you really at Eton, and did I know this? Or is that a joke too? Because if you were, did you know Angus McIntyre or Alex Scott? It would be too weird if you did and I only just found out. I guess I'll find out this weekend!